As the state of popular music unfolds, for me, one quality that seems to be becoming scarcer and thus more valuable, is musical honesty. Artists playing music that they like, being themselves as they play it, and delivering it as directly and as free from pretense and artifice as possible. The late-1990s commercial music scene sometimes seems to be made up of synthesizer manufactured rhythm tracks, stupid dance crazes, market-researched grunge, musicians becoming wealthy from what they look like in their video, rather than how, or indeed if they can play, and pop stars more notable for what they do off-stage than on. So even when musicians cover stylistic ground that has been explored before, it becomes a great joy to hear an artist making music that ignores all the trends, is completely honest and from the heart, played by real musicians more or less in real time, and done from the standpoint of a lot of experience. And if there is any musical style that sounds better and better as time goes on, it's the great American tradition of blues, R&B and soul. Fortunately, the blues is on a roll, probably because more and more people are becoming fed up with the phoniness of commercial pop. And as has happened periodically over the years, younger generations are re-discovering the roots of rock & roll. Unlike many pop styles, blues-based music gets better as the artist matures. The current blues revival has given a boost to the careers of many veteran artists, many of whom have been eking out a living performing in small clubs for decades, playing their music directly to audiences and staying true to their musical roots. 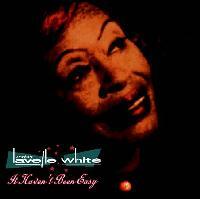 This week we have another superb example, the newest album by Lavelle White -- Miss Lavelle White as she is known, a CD entitled It Haven't Been Easy. Lavelle White was born is Louisiana and moved to Houston in the mid 1950s when she was 15. There she met guitarist Clarence Hollimon, a first-rate blues artist whose own recording career has also been revived recently. Another Texas bluesman, Johnny Copeland, helped get her a recording contract in 1958 with Duke Records, a home for many Texas blues artists at the time. She made several records, some of which became regional hits, for Duke until 1964. Unlike many women blues singers at the time, Miss La-Vell, as she was known on record at the time, was a prolific songwriter. Indeed she ghost-wrote Bobby Blue Bland's 1960 hit Lead Me On, which was credited to Deadric Malone. During the 1960s, she toured extensively with Bland, Junior Parker and shared stages with Sam Cooke, Otis Redding, Jerry Butler, the Drifters, the Isley Brothers and James Brown, among others. In 1978, she moved to Chicago where she became a regular on the club scene for the next eight years, before returning to Texas in 1986. In recent years, she has been part of the prolific Austin music scene, being a regular at Antone's blues club. The associated label, Antone's Records released her comeback album in 1994, called Miss Lavelle. Now she is out with the outstanding followup, It Haven't Been Easy. She is joined by a blue-chip backup band, including among others, Clarence Holliman, plus guitarist Derek O'Brien, who served as the album's producer, a horn section including Mark Kazanoff and veteran Gulf Coast studio drummer George Raines. They serve up a great mix of some blues, but mainly sweet soul and R&B, encompassing the Memphis, Muscle Shoals, early Motown, Texas and even the old Atlantic Records Aretha Franklin sound. It's all performed with generous amounts of taste, enthusiasm and the kind of musical honesty that makes this album something really special. Miss White herself is a fine singer, who can belt out a song, or deliver a smooth ballad with the kind of voice of experience that makes every note just right. She also brings that level of class to her songwriting. Most of the album's music is original, and she has penned a bunch of new songs that could easily become R&B standards. It Haven't Been Easy, the new album by veteran blues and soul singer-songwriter Miss Lavelle White is one of the most honest, unpretentious, classy, beautifully performed and downright enjoyable blues-influenced albums of its kind to come along in quite a while. Miss Lavelle is a fine performer who can deliver the songs without a lot of fuss, but can drive home their message with a soulful elegance that recalls some of the great R&B singers of the past and present. The backing musicians, in this Austin, Texas, made album, couldn't have done any better in both arrangements and performance. Producer/guitarist Derek O'Brien deserves high praise for capturing the spirit of the music, and with engineer Stuart Sullivan, getting it on tape with the kind of integrity sonically that Miss Lavelle brings to her music. The mix and recording are absolutely first-rate. The more time goes by, the more one comes to appreciate musical honesty and lack of pretense. This album is a textbook example of doing everything right, and a reminder of why classic American styles like this will survive all the changing winds of the pop fads.